GRTC Pulse is a modern, high capacity rapid transit system that serves a 7+ mile route along Broad Street and Main Street, from Rockett's Landing to Willow Lawn. The Pulse links to many exciting destinations, businesses, services and restaurants. Eco Supply & EcoCuts are proud to have been a part of the new GRTC Pulse rapid transit system in Richmond, VA. The benches and lean rails at each bus station were fabricated and installed by our EcoCuts team. This is another great use of Richlite for a Municipality. 2" thick Richlite paper composite panels were used to fabricate the benches. 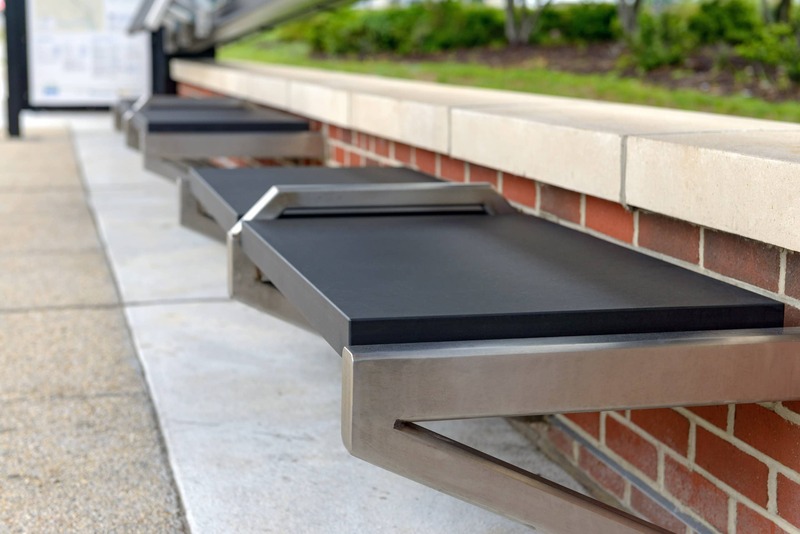 Richlite is a durable, sustainable material that is impervious to water, making it the perfect material for outdoor bus station benches. Interested in learning more about Richlite? Eco Supply offers an AIA certified CEU on Paper Composite Panels, click the button below to request a presentation for your firm. We also offer an architectural sample box of Richlite products. Click the button below to request a sample box be sent to your office or material library.